As Islam’s 1,400 year old assault on the West has been rekindled for some decades now, I decided during a small available window of time to read about a 50-year period of that conflict that I knew little about. For anyone interested in a fascinating overview of the struggle in the Mediterranean from the fall of Rhodes in 1522 to the battle of Lepanto in 1571, I highly recommend Roger Crowley’s book Empires of the Sea; The Siege of Malta, the Battle of Lepanto, and the Contest for the Center of the World. At just under 300 pages, it is a gripping story of valor, treachery, and the seeming whims of fortune that move empires. While there are sketches of the background and character traits of the main players (Suleiman, la Valette, King Charles, etc. ), the main focus is not on biography, but on the part these men played in shaping the conflict. With the rising fear of Islamic violence in Western European countries today, perhaps they can detect the faintest whiff of what most of Christendom felt in the 16th century, when much of Europe was at risk from the Ottoman Turks. Rather than recount the story, I will just mention a few odds and ends that struck me. When a new sultan succeeded his father in the Ottoman empire, it was required by law that all of his brothers be killed to prevent any internal dissension over the succession. Now, there are certainly shameful cases in Christian history of a king trying similar things, but the culture at large would have still recognized that murdering one’s brothers for the sake of political power is intrinsically evil. In the Ottoman empire it was institutionalized. There was an instance in which the sultan Selim’s horse fell, and a man hurried over to help him. He was hung for touching the sultan, as if the sultan were an Islamic Ark of the Covenant. While by modern standards both sides engaged in “war crimes,” the Turks were particularly brutal. Here are just a few examples. After Nicosia fell on Cyprus, one witness wrote “the victors kept cutting off the heads of old women; many of them as they marched along, to prove their swords, split open the heads of old women who had already surrendered.” When Famagusta fell, the victorious Turks cut off the ears and nose of the leader of the defenders, Bragadin. After he had suffered for 12 days, the Turks had him skinned alive, after which his skin was stuffed with straw and displayed. One incident that struck me as particularly senseless was when a messenger became enraged that his horse stumbled, grabbed his sword and hacked the horses legs off. This vicious depravity is certainly still alive and well in parts of the Muslim world today for anyone who has eyes to see. It was almost a miracle that the pope was able to cobble together a united Christian response at all, as the Christian countries were almost as hostile to each other as they were the Turks. In fact, the Venetians were simultaneously negotiating for a separate peace with the Ottoman empire while they were at the negotiating table for the Holy League. 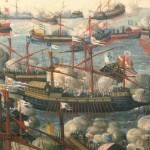 Before the battle of Lepanto, the Ottoman fleet had returned to port after a long season of campaigning. Many of their men had already left so that their fleet was not fully staffed, and their position in the harbor was unassailable. Some of their leaders argued forcefully against leaving the harbor, but the sultan, far away and with no first-hand knowledge of the military situation, had sent orders for them to engage the Christian fleet. It sounded remarkably like the modern tendency for political leaders to micro-manage the battlefield from their offices. Ironically, had they simply sat in the harbor, the Holy League fleet would have been able to accomplish little, and would almost certainly have dissolved amidst the tensions that already existed between the participants. Militarily, the battle of Lepanto was not a crippling setback for the Ottoman Turks. Just one year after Lepanto they had already rebuilt their fleet to an even larger size, while the Holy League had fallen apart. It was more of a psychological boost for Christendom at a time when the Turks seemed unstoppable. It was actually inflation, driven by the silver and gold coming over from the New World, that ended up doing more damage to the Ottoman empire than Lepanto. What a difference 450 years makes. Muslims who wish to attack the West no longer need to brave the sea and then scale the walls of a city under fire. They merely need a plane ticket to a post-Christian West that has used up its store of Christian capital, and no longer has the moral courage to even distinguish friend from foe. Given that we are also near the 500th anniversary of the beginning of the sad plethora of heresies known as the Reformation, which were spreading like a cancer at the same time that Europe was suffering from these attacks of the Ottoman Turks, don’t be surprised if the next year or two has a certain 16th century feel to it – except that today men can follow little girls into the bathroom. Come to think of it, the life of a Christian galley slave can’t have been that bad! Add this to my ever-growing list of books I’d like to read and never get to! Don’t forget, men: We have a list of Recommended Reading you can add to — if you need to remember how (or just want me to do it) let me know!